After A Forced Abortion, A Roaring Debate In China A gruesome photo from a forced abortion recently spread across the Internet, provoking outrage at local officials. The anger comes as criticism of China's one-child policy is increasing. Experts say it's creating a demographic disaster that could have profound economic and social consequences. Feng Jianmei and her husband could not pay $6,000 in fines for violating China's one-child policy. In June, when she was seven months pregnant, local officials abducted her and forced her to have an abortion, her family says. The case has provoked widespread outrage. Deng Jiyuan and Feng Jianmei, a couple from northwest China's Shaanxi province, have a 6-year-old daughter. Under China's complicated birth calculus, they were barred from having another child. But they tried anyway. "We planned this pregnancy because our parents are old, they want us to have another child," Deng, 30, explained by cellphone last month from his home in Shaanxi. That decision led to a sequence of events that has ignited a firestorm and renewed debate over the country's one-child policy. 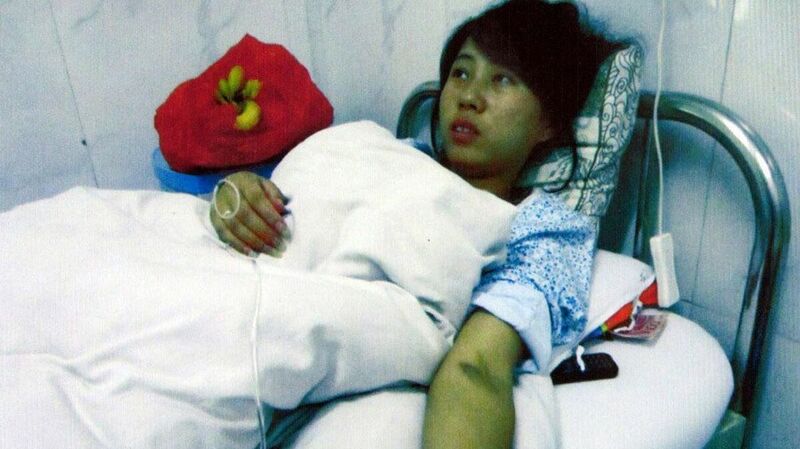 After local family-planning officials learned 23-year-old Feng was expecting, they demanded more than $6,000 in fines. When the couple failed to pay, officials covered Feng's head with clothing, abducted her and held her for three days. Then, Deng says, he got a call from a local family-planning official. "He said, 'I told you a long time ago that you should have got the money ready and you didn't do it,' " Deng said. "One hour later, my wife called and said it was too late. She'd had an injection." The injection induced labor and ensured the couple's 7-month-old fetus was stillborn. Deng was furious. "We want justice," he said. "I want those gangster officials to be punished." Afterward, family members uploaded a photo of the dead child to the Internet and the story exploded across China, enraging ordinary citizens. "This is first-degree murder," one person wrote in a typical comment on a Chinese version of Twitter. Last week, the government announced it had fired one local official and punished others involved in the case. After all, forced abortion is illegal in China. But opposition to the country's one-child policy today goes well beyond human rights. Increasingly, Chinese scholars say birth restrictions are creating a demographic disaster that will leave China with far fewer workers to drive its economy and a disproportionately large number of elderly to care for. "In the field of population studies, everybody thinks the policy should be modified," says Zheng Zhenzhen, a demographer with the Chinese Academy of Social Sciences. 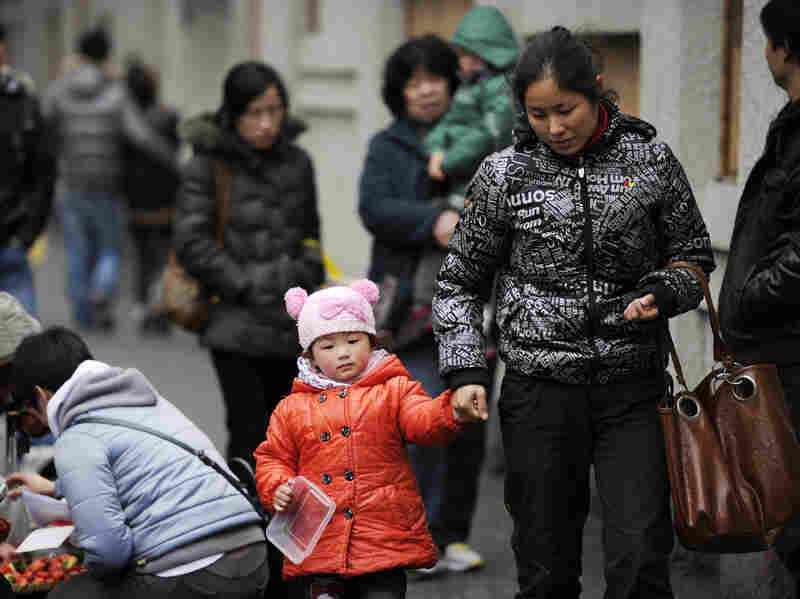 A mother and child walk in Shanghai. China's one-child policy has been in place since 1979. There's now a debate about whether the policy should be eased or dropped. "It's actually a pretty absurd policy," says James Liang, a leading businessman in Shanghai. "The phasing out of the policy should have begun at least 10 years ago," says Wang Feng, who runs the Brookings-Tsinghua Center for Public Policy in Beijing. The Communist Party instituted the one-child policy in 1979 amid fears that China could collapse under the weight of its massive population. Although there are many exceptions, the policy generally allows one child per couple in cities and two children in the countryside if the first-born is female. But Wang says the problem now isn't that Chinese couples are having too many kids, it's that they're having too few. Last year, census results showed what demographers had long suspected: The fertility rate is very low. "For each couple, the expected number of children in their lifetime is 1.5," he says. That's well below the number needed to replace China's current population. Consequently, Wang says, this dynamic country — now widely seen as a world-beater — is fated to age very rapidly. 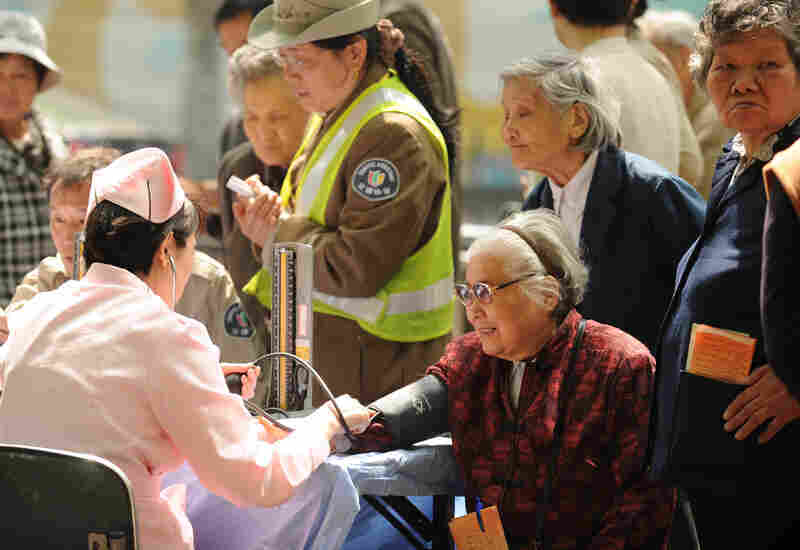 "The magnitude of the challenge brought about by population aging is mind-boggling," says Wang, who has a doctorate in sociology from the University of Michigan. China now has about 1.3 billion people. That includes an elderly population of about 180 million, Wang says. In less than 20 years — by 2030 — that number will be 360 million, he says. "That's going to be bigger than the population of the United States right now," he says. "It's a very scary situation." 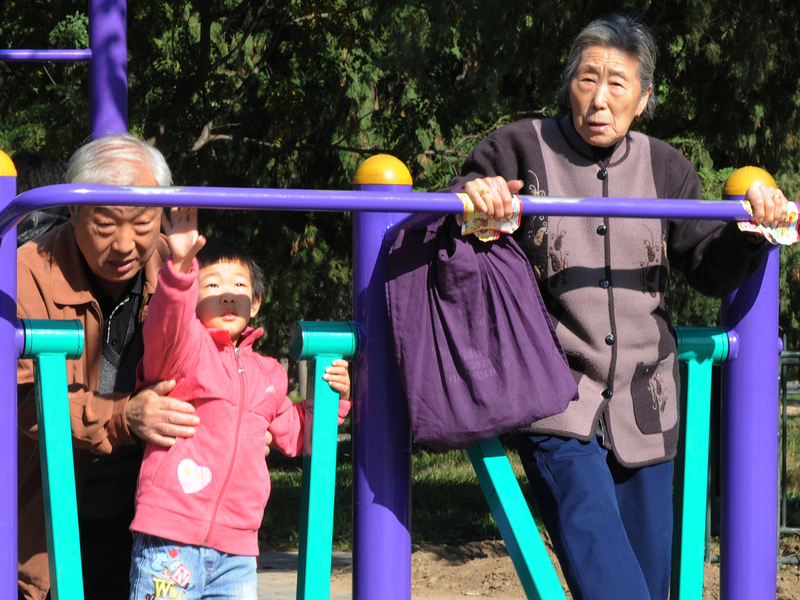 Young and old exercise at the Temple of Heaven park in Beijing in October. Experts say China's health care costs will be difficult to fund due to the population imbalance. As the population ages, health care costs are expected to soar. With couples having fewer kids, there will be far fewer workers to pay for that health care. "I think the harm has already been done," says Wang. "So even if China stopped the one-child policy tomorrow, this new birth would not become adult labor until 20 years from now." James Liang, an economist and chairman of Ctrip.com, the Expedia of China, published a book in April called Too Many People in China? In it, he argues that as Japan's workforce aged, innovation and entrepreneurship suffered and contributed to the country's economic stagnation. He worries the same thing will happen to China. "The situation is actually pretty gloomy, pretty bad, pretty urgent," says Liang. Liang fears young Chinese professionals will get trapped behind a bigger generation on the career ladder and much of the innovative energy that fires an economy will be lost. "If China gets into this problem of aging and China is not as creative as other economies, China will definitely hit some bottleneck in terms of its economy or competitiveness," Liang says. China's one-child policy has loosened over the years. For instance, parents who were only children have long been allowed to have two kids, but government officials fear further relaxation could spark a new baby boom. Zhang Yanyun doesn't think so. He paints buildings in Taicang, a city in east China's Jiangsu province. Through provisions in the population policy, Zhang and his wife were able to have three kids. He was able to have two children because he is from the countryside and his first born was a girl. And he was allowed to have a third child because his brother is disabled and can't have children of his own. Zhang Yanyun paints buildings in east China's Jiangsu province. He has three kids, but wishes he only had one because raising a child in China has become so expensive. Zhang, smoking a cigarette at a picnic table outside a KFC, says his son's formula and snacks alone were taking up a huge chunk of his average monthly wage of $126. "I really feel like I'm being suffocated," he continues, echoing many parents who complain about the high cost of child-rearing in China today. "Honestly, my wife and I can hardly buy any new clothes in a year. It is too hard to raise a child. I can't afford it. I certainly would have preferred to have had only one child." Zheng Zhenzhen, the Chinese demographer, says people like Zhang are typical. 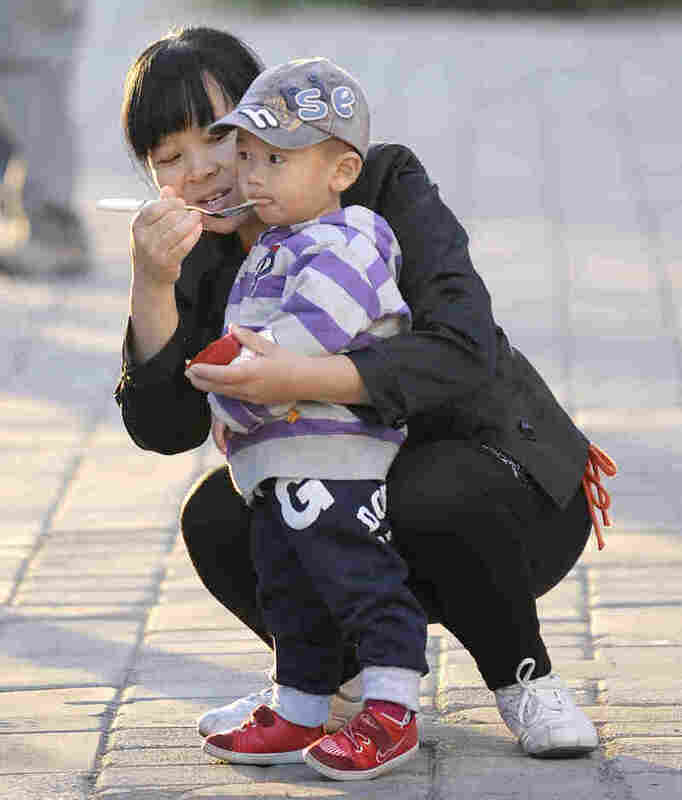 She has surveyed more than 2,000 women of child-bearing age in Jiangsu. Most didn't want another child. "We found that having less children is a very widely observed norm," says Zheng. "Even the farmers, they don't want too many children, just one or two." Family-planning workers are aware of the research, but must enforce the rules. Some are riddled with guilt. Zhang Erli used to work as a high-ranking official with China's National Population and Family Planning Commission. Last month, he made an extraordinary, tearful apology on TV to the millions of women who have had to end their pregnancies because of the policy. "I felt sorry for our Chinese women. I feel guilty," he said in an interview on Hong Kong's Phoenix TV. "Chinese women have made huge sacrifices. A responsible government should repay them." Given the demographic data, the public anger, the official guilt — why not declare victory and change the policy? NPR requested an interview with China's family-planning commission. It never responded. Demographers say some officials are reluctant to make changes because they still think China has too many people. This is not irrational. Try to get on a subway in Beijing at rush hour and you would probably reach the same conclusion. Demographers say another reason change has been so slow is because China's current leadership is cautious and risk-averse. "China is a huge boat and you cannot make a sharp turn; you do things gradually," says Zheng of the Chinese Academy of Social Sciences. "I agree with that, but at least we need to move." As for the couple from northwest China who were forced to abort their fetus, they're still angry and scared. Local officials led villagers to denounce the couple as traitors for speaking to foreign media. 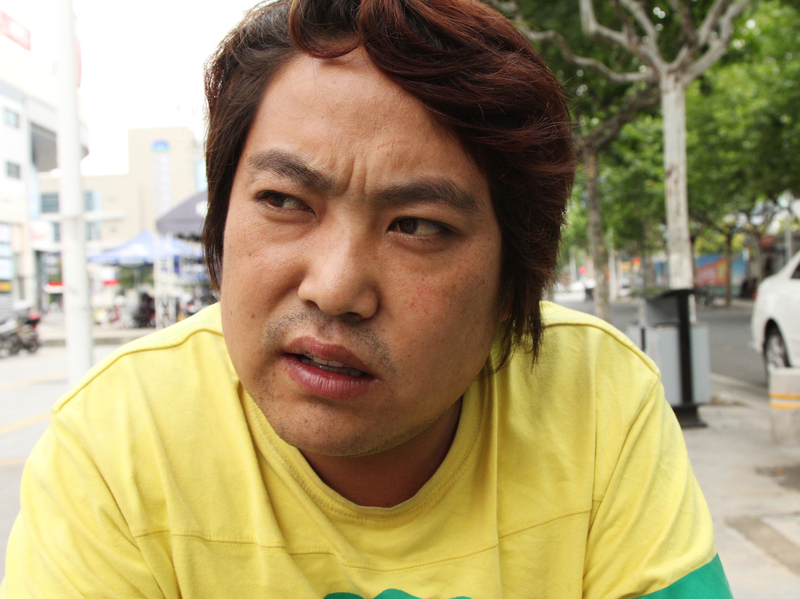 The husband, Deng, was attacked and went into hiding. Last week, he surfaced in Beijing. He's thinking about suing the Chinese government.